Serbian Cemetery’s Chapel of the Assumption of the Virgin Mary is a replica of a 1,000 year old structure in Serbia. The Chapel was dedicated by the local Russian Orthodox Bishop Alexy and the Russian Orthodox Priest Rev. Vladimir Sakovich. 1801 Hillside Blvd, Colma, CA 94014. Lone Mountain/Laurel Hill cemetery in San Francisco was opened in 1854. Toll was charged to the roads leading to the cemetery, since that area was some distance from the settled part of the city. 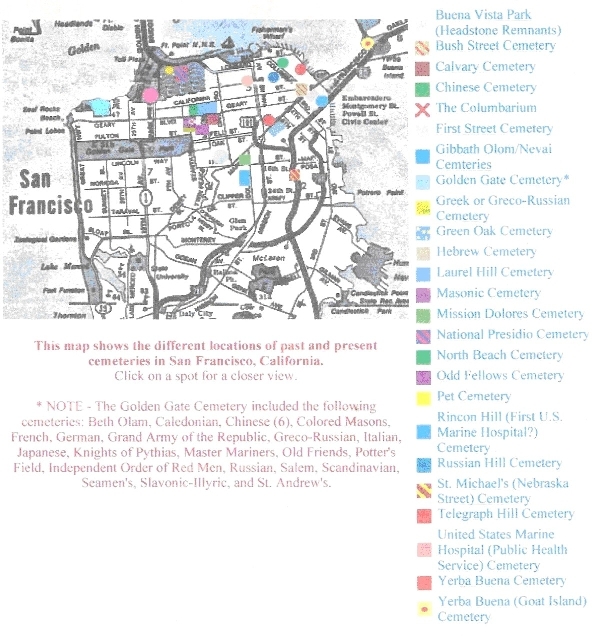 As can be seen by clicking on the left hand map image above, the area bounded by Geary, Presidio, Arguello and California Streets was renamed to Laurel Hill Cemetery in 1867 and Serbian Cemetery was a part of it. 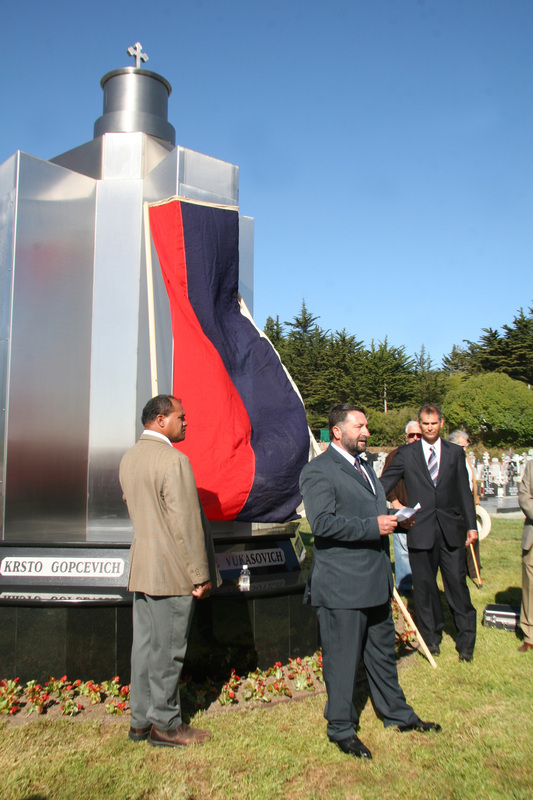 The City of San Francisco passed ordinance #25 on March 26, 1900 stating that no further burials will be allowed in the City and County of San Francisco. For many years, the Orthodox Society administrated the Orthodox Cemetery, but by 1890 the Orthodox Society was in decline with financial difficulties and they were forced to secure a loan from the Serbian Society and later forfeit their property on Turk and Parker Streets to the Serbian Society. Colma became the chosen area for the cemeteries and Serbian Cemetery started relocation in 1901 on the land that was purchased by FSBS . In 1901, the original site was five acres and in 1950 an additional 11 acres were purchased. That means that the total area of the Cemetery land is 16 acres, of which approximately 50% is occupied. The cemetery is opened to all Orthodox Christians and there are about 12,000 burials including Serbians, Russians, Greeks and Armenians. Section one: runs along Hillside Blvd. and was the first area opened for burials where we have many historical sites, including the monument to Sebastian Dabovich, the first American-born Serbian priest and founder of the Serbian Orthodox Church in America. Near the chapel is the tomb of Russian Metropolitan Theophilus Pashkovsky (1876-1950), Archibishop of the Russian Orthodox Church in the US and Canada. There is the monument to Gen. Draza Mihailovich built by rescued American and British airmen during WWII and to Gregory Bologoff, regimental commander of the Czar’s Cossacs who led a group of 5000 Russians to sanctuary in Shangai, China and in 1948, with the help of Sen.W. Knowland, to the US. 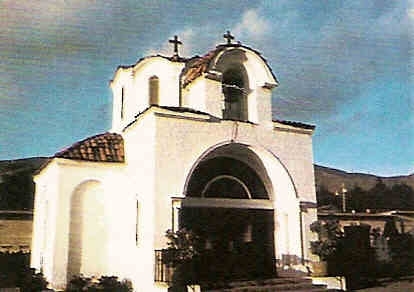 In 1929, the center of section one of the Church was built in the Byzantine style and was dedicated in 1930 to the Assumption of the Virgin Mary. There is almost no space in section one and all available locations are reported in the Monthly Inventory Report. In section one, besides graves, there are two mausoleums: one built behind the Chapel and dedicated to the memory of the past presidents and, at right, the St. Sava Mausoleum dedicated to the founders of the FSBS. able to build and dedicated the Serbian Cultural Center and to preserve our History in the Museum and “Nicholas Vucinich” library . At the same time we erected the Monument to the founders of Serbian Montenegrin Literary and Benevolent Society-presently First Serbian Benevolent Society. Section two: another parcel of land that is along Hillside Blvd., like section one. The majority of burials are Russian and it is the smallest parcel of the cemetery. Section three: located behind the Chapel and has a reserved area for FSBS members. At the end of section three, a monument has been erected to the memory of the original founders and all past members. Section four: section three was developed as a “honeycomb site” and later outgrew that area and spread out on both sides in the form of underground vaults. Section four has several important Russian monuments including monuments to Czar Nicola II, the first monument erected in the free world; to St.George Cavalliers; and to the Russian Cossacs. Section four also has two mausoleums: St.Nicolas, built in memory of our Russian friends, and St. Vasilije, dedicated to past members of the Board of Directors of FSBS and SMLBS. The plaque was placed and listed the names of the Board of Directors at the time of the dedication. It is puzzling why we are not selling more spaces in St.Vasilije, since past sales in St. Sava, St. Nicolas and the mausoleums behind the chapel were going well. The St.Vasilije mausoleum was built with the intention to continue in the future with the same design along the outside the perimeters of the cemetery and act as a wall. Above section four is an old flower house and some storage area. Section five: the newest developed area which still has space reserved for future expansion. We just built a new section consisting of 160 underground vaults which include marble frames and a base for a monument. The section was opened on March 1, 2009. Behind the office we have equipment storage areas and space for vehicle parking. We are also in the process of developing new offices, a meeting room, a museum and a library.